MADISON — The Department of Natural Resources will issue slightly more bear hunting permits this year in Douglas and parts of six surrounding counties despite an estimated decline in the bear population. The DNR Board on Wednesday, Jan. 23, approved issuing 2,440 bear hunting permits up from 2,135 in Zone D, which includes all of Douglas, Burnett and Washburn counties and parts of Bayfield, Ashland, Barron and Polk counties. DNR staff is using a new model that estimates bear population and the impacts hunting will have on the population in years ahead. “The old model was an accounting function … We’re a lot more confident in the new model,” Scott Walter, a DNR large carnivore specialist told the DNR Board. The new model factors in hunter success rates, harvest registration numbers, property and agricultural damage reports and nuisance complaints. Hunting is one of the key tools the DNR uses to manage the state’s bear population estimated to total 24,000, up from approximately 9,000 in 1989. Balancing the interests of hunters, farmers, property owners and the condition of other resources is an ongoing challenge in setting annual hunting permit levels that also ensures maintaining a healthy bear population in the state, Walter said. Bears’ reproduction rates are slow with sows typically bearing one to three cubs every other year. When overhunted, the population can take years to recover, Walter said. Zone D has more bears than any of the state’s four management zones, but higher harvest quotas in recent years there have resulted in a slight decline in the population, Walter noted. However, the DNR will increase the number of Zone D hunting permits as the DNR believes the the area’s bear population can sustain an estimated 1,300 bears harvested this year. Last year, hunters had 50.5 percent success rate in taking 1,170 bears. Based on the number of permits issued and a slightly lower success rate, based on recent trends, hunters would take 1,300 bears this year, according to DNR estimates. Statewide, hunters last year had a 28 percent success rate as 3,628 bears were harvested and 12,970 permits were issued. This year, permits statewide will decrease to 11,595 and the DNR maintains the bear population can sustain a harvest quota of 3,835.up from last year’s harvest total. The overall decrease in permits is due largely to a 25 percent reduction in Zone A, which includes the southern half of Ashland County and parts of Iron, Sawyer, Rusk, Taylor and all of Price counties. The DNR believed the bear population to be stable in Zone A but the new estimating model it’s now using indicated the population had been in decline for several years, Walter said. The DNR will issue will issue 1,590 permits this year in Zone A compared to 2,130 last year. The DNR considers the status of black bears to be “abundant” across the northern one-third of the state and “common” in the areas across much of the central part of Wisconsin. 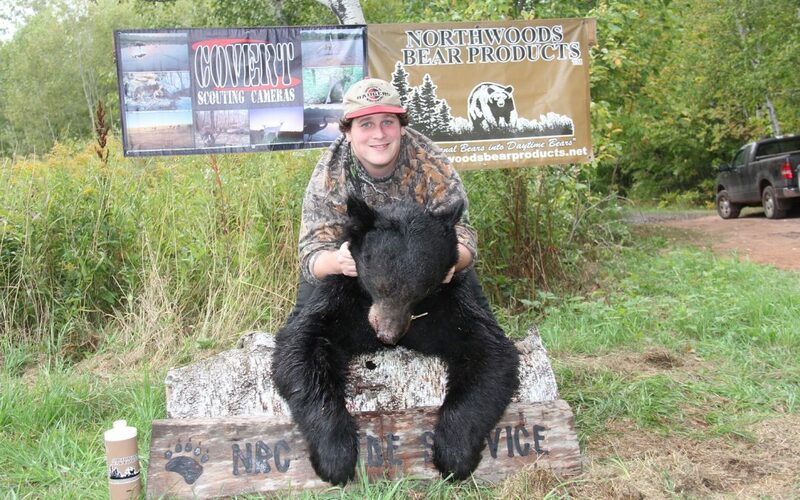 While the DNR has being selling fewer hunting licenses overall, interest in bear hunting has “skyrocketed” in recent years with 125,000 people applying for licenses or preference points. The current wait time to obtain a license is about eight years, Walter said. There’s an annual drawing for licenses and a system that allows individuals to accumulate preference points increases the odds of getting one. To avoid losing accumulated preference points, individuals need to apply for a license or a preference point at least once every three years. Contact the DNR at 888-936-7463, or contact the DNR Service Center to check on your accumulated preference points. DNR staff will present a new bear management plan in April that will give the DNR Board a 10-year look ahead at the state’s bear population, its health, distribution and impacts of hunting and disease.